However, he also mentions that investing in developed international equity markets can expose you to economic cycles / pressures that are out of sync and currency exchange rates. These types of effects can be clearly seen by looking at the chart above which has been prepared using the Yahoo Finance website. 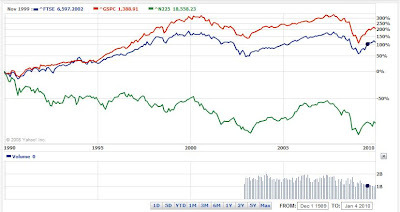 The period used is December 1989 to the present day with the red line being the S&P 500 (USA), the blue line being the FTSE 100 (United Kingdom) and the green line being the Nikkei 225 (Japan). It is these types of effects that I am looking to take advantage of in my retirement investing strategy by regularly balancing back to my desired regional allocation within my international equities allocation. This is exactly the same principle I am using with my total low charge portfolio allowing me to buy when the market is low and sell when the market is high. When choosing what regions to invest in I wanted to also ensure that my allocations were large enough to make a difference within my total low charge portfolio. For example my nominal allocation (before allowing for corrections in line with PE10 ratios) to international equities is 15%. If within my international equities I have an allocation to a region at 20% then this will affect 3% of the total portfolio which matters. If I went down as low as 5% then the total affect would be only 0.75%. A 10% swing in stock market prices in this region would then only make a difference of 0.075% to the total portfolio which in my opinion is insignificant. Others include South & Central America, Emerging Europe, Middle East & Africa and Developed Asia. These other regions have not been deliberately chosen but are merely the by product of buying low cost funds that cover a little more than the regions I am interested in. Sectors within these regions include energy, materials, industrials, consumer discretionary, consumer staples, health care, financials and information technology.